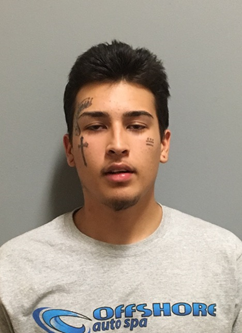 On Tuesday afternoon at around 2:55 PM, the San Luis Police Department responded to the Little Caesar’s Pizza located at the 1200 Block of Main Street in regards to an armed robbery that was being reported. The suspect had entered the business and pointed a weapon at the cashier. The suspect then fled on foot from the scene. SLPD Officers were able to apprehend the suspect as he was fleeing from the scene and located him at the 300 Block of Los Oros Street. The suspect was identified as 18 year old Julian Humberto Villalobos. SLPD was able to recover the weapon that was used as well as the money that was taken. Julian was booked into the Yuma County Jail for Armed Robbery and Assault with a Deadly Weapon. Anyone with information is asked to contact Detective Ernesto Prieto at 928-341-2020.